At the Grand Canyon Monitoring and Research Center (GCMRC), we are looking for affordable and efficient alternatives and augmentations to our current approaches to monitoring the geomorphic condition of sandbars, terraces and other fine-sediment deposits along the Colorado River in the Grand Canyon region, Arizona. 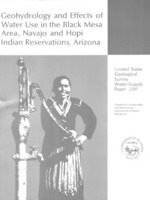 Geohydrology and effects of water use in the Black Mesa area, Navajo and Hopi Indian Reservations, Arizona; 1983; WSP; 2201; Eychaner, James H.
Sass, J.H. ; Stone, Claudia; Bills, D.J. 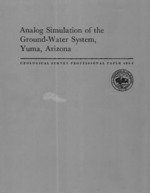 Shallow subsurface temperatures and some estimates of heat flow from the Colorado Plateau of northeastern Arizona; 1982; OFR; 82-994; Sass, J. H.; Stone, Claudia; Bills, D. J.
Geohydrology and effects of water use in the Black Mesa area, Navajo and Hopi Indian Reservations, Arizona; 1981; OFR; 81-911; Eychaner, James H.
Appel, Cynthia L.; Bills, Donald J. 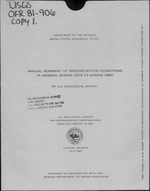 Maps Showing Ground-Water Conditions in the San Francisco Peaks Area, Coconino County, Arizona - 1979; 1981; OFR; 81-914; Appel, Cynthia L.; Bills, Donald J.
Map showing ground-water conditions in the Canyon Diablo area, Coconino and Navajo Counties, Arizona - 1979; 1980; OFR; 80-747; Appel, Cynthia L.; Bills, Donald J.
Analog simulation of the ground-water system, Yuma, Arizona; 1977; PP; 486-I; USGS NUMBERED SERIES; Water resources of Lower Colorado River-Salton Sea area; Patten, E. P., Jr. 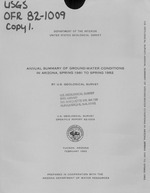 Annual summary of ground-water conditions in Arizona, spring 1975 to spring 1976; 1977; WRI; 77-10; Babcock, H. M.
USGS employees, John Hoffmann, Corey Salmond, Robert Fritzinger, and Chris Smith are being interviewed by Naomi Pescovitz from KVOA on January 22, 2010. Robert Fritzinger and Corey Salmond are making a streamflow measurement at Rillito Creek at La Cholla BLVD near Tucson streamflow gaging station. The updated peak was 1,360 cubic feet per second (CFS) on January 22, 2010. Gordon Haxel (USGS, Flagstaff) explains the Jurassic geology of the Baboquivari Mountains, Arizona. Kitt Peak, Arizona, November 2009. 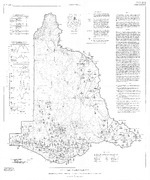 Bob Powell (USGS, Tucson) holds the map. The former Pigeon Mine in northern Arizona is seen here looking towards the northeast. Uranium levels in Pigeon Spring, just north of the Grand Canyon, are likely due to a natural source of uranium and not related to the nearby former Pigeon Mine, according to a recent study by the USGS. Grand Canyon sand was photographed with a hand-held point-and-shoot camera in a waterproof housing. USGS staff evaluates flood damage caused by the recent Havasu Creek Flood, August 2008. USGS streamgagers make a discharge measurement in southwest Arizona. Footage of USGS streamgagers taking measurements on the Santa Cruz River in Arizona. USGS streamgagers make a low flow measurement on the San Pedro River at Charleston. The USA-National Phenology Network (USA-NPN), a consortium of government, academic and citizen-scientists, is launching a new national program built on volunteer observations of flowering, fruiting and other seasonal events. The fractures, known as "columnar joints", are the first that have been observed on a planet other than Earth. Astrogeologists at the U.S. Geological Survey in Flagstaff provided critical datasets used in the latest release of Google Earth. The updated software enables users to explore Mars in high detail. "Without the ability to accurately co-align data sets, applications like Google Earth would not be nearly as useful," said Trent Hare, a GIS expert with the USGS Astrogeology Team. Dr. Julio Betancourt, a U.S. Geological Survey senior scientist, was recently awarded a prestigious 2008 Presidential Rank Award. Betancourt, who has conducted groundbreaking research in how climate variability affects ecosystems, is also an adjunct professor at the University of Arizona, where he received his graduate degrees. Local planetary geologist Chris Okubo is on a mission to understand the past roles of groundwater and faulting on Mars by studying similar locations on Earth. Okubo works in the Astrogeology Research Program for the U.S. Geological Survey (USGS) in Flagstaff. Long-term trends in landscape conditions have significantly reduced sagebrush habitat and populations of greater sage-grouse, according to a new study examining the bird's chances of survival. The Upper San Pedro Partnership was recognized with the Department of the Interior's Cooperative Conservation Award today. Time lapse videos of sandbars from the Glen Canyon Dam high flow experiment have been released by the U.S. Geological Survey (USGS). Competition for water is becoming more intense as the nation's population continues to grow, increasing the demands for water use in agriculture and power production. A report published by the U.S. Geological Survey (USGS) contains a regional map and associated database that inventory 121 locations of reported natural asbestos and fibrous amphibole occurrences in the Southwestern United States, including Arizona, Nevada, and Utah. The Department of the Interior has proposed an experiment using high flows from Glen Canyon Dam to study and improve Colorado River resources in Grand Canyon National Park.